The Locke property consists mainly of a large three story brick home and an adobe barn having a brick facade. Dean Jewett Locke, its owner and builder was born in 1820, and came to California as part of the Boston-Newton Stock Company in 1849. Although a Harvard graduate and medical doctor by profession, Locke became extremely influential as a farmer-rancher. Returning to Massachusetts, he married Delia Hammond bringing her west via the Isthmus of Panama. During the early days of his arrival, Locke and a brother, Elmer, engaged in selling garden varieties to miners in the Mother Lode. Subsequently, Locke served as the local doctor as well as a rancher until his death in 1887. His family consisted of thirteen sons and daughters - the property ultimately being deeded to the 13th child. The barn was used as an armory by the Mokelumne Light Brigade, a local militia, called to active duty during the Civil War. It was also a meeting hall for the Sons of Temperance and the Congregationalist Church. The town of Lockeford was laid out on the Locke ranch and named after the founding family in 1859. The settlement was envisioned as the head of navigation on the Mokelumne River. After 1865, however, river traffic to the mines diminished, and the railroads soon after put an end to river navigation on the Mokelumne. 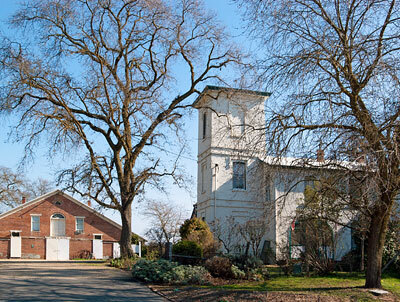 The property is now a bed and breakfast inn located in the Lodi wine appellation.